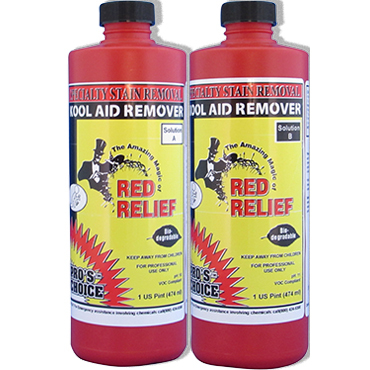 Red Relief® for Wool Stain Remover Removes food dye stains from wool! 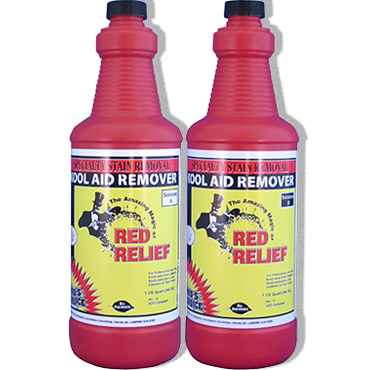 Red Relief Stain Remover is a three-part system formulated especially for removing food and beverage dyes like Kool-Aid from wool carpets and rugs. Solution “A” contains wetting agents and reducing bleach. Solution “B” contains wetting agents, solvent and water conditioner. Solution “C” (CSS) Neutralizer contains a dye stabilizer to reduce the likelihood of over-bleaching the wool or causing dye loss in the wool. Red Relief for Wool is a fast acting. Pro's Choice Red Relief for Wool actually alters the stain color to make it disappear as if by magic. You have to see it to believe it! 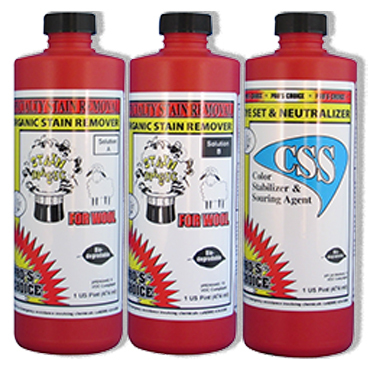 These food dye additive stains are NOW money making opportunities for your carpet cleaning company! Heat is not required to activate this product! Red Relief for Wool is a different formulation from the regular Red Relief and cannot be interchanged or substituted for each other. Safe for wool and stain-resistant carpet when properly used. Pro’s Choice Red Relief® for Wool Stain Remover stain remover removes food and drink dye stains from wool! Now you can remove tough synthetic food dye stains like Kool-Aid® from wool fibers! 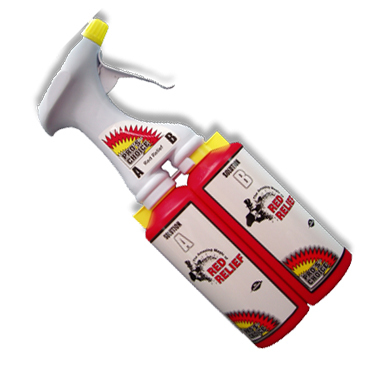 Red Relief for Wool Stain Remover unleashes new chemistry for old problems. 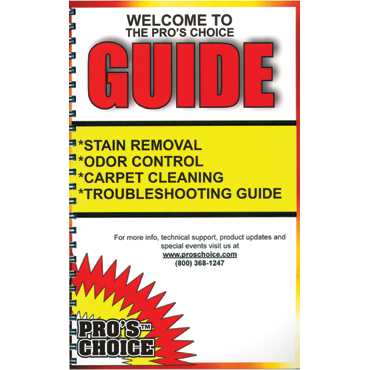 For removal of a specific stain on wool or silk, use the Pro’s Choice 50 Page Printed Stain Guide. Form: Red Relief comes in three parts (“A”, “B” and “C”). Use Concentration: Parts “A” and “B” are mixed together undiluted in equal parts before use. Part “C” is applied undiluted to the treated area after the stain has been removed. Storage: Protect product from freezing. Keep container closed when not in use. Store in cool area. Shelf Life: 1 year maximum when unmixed. Manufacturer: Pro’s Choice (CTI - Chemical Technologies, Inc.®). NOTE: For natural stains such as coffee, tea and wine (including red wine) on wool, use Pro's Choice Stain Magic for Wool! NOTE: Check the back of the rug - the stain may be larger and worse there - resulting in the stain coming back on you if you’re not careful! CAUTION: Removal of some of the carpet dye is always possible in this type of system! You are strongly encouraged to make some Kool Aid stains on wool carpet and practice the procedure given here to perfect your skill before attempting to remove stains from your customer’ carpet. Always test an area for color fastness before using. Removing synthetic food dye stains from wool, especially wool that has been dyed with vegetable dyes, is a procedure that requires your absolute attention to detail and patience. Thoroughly extraction clean the spot on the carpet to remove all surface contamination. Follow with multiple vacuum only dry strokes to leave fibers as dry as possible. Blot the spot as dry as possible with a dry white clean towel. 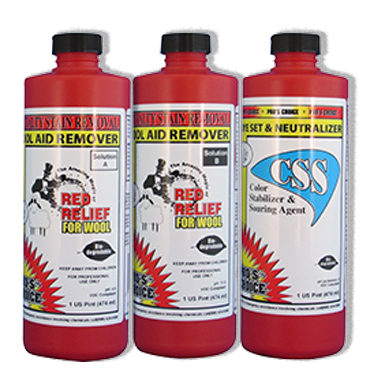 Mix equal parts of Red Relief for Wool Solution “A” and Solution “B” in a clean container or use the Red Relief Dual Chamber Sprayer Kit. Apply the mixed solution to the stain liberally to wet all the stained carpet fibers (and reach the backing if it’s stained too). Allow up to 10 minutes dwell time for the stain to disappear or change to a light yellow color. Thoroughly flush and extraction-rinse the stain and surrounding area. Follow with multiple vacuum only strokes to leave the fibers as dry as possible. If any stain remains, repeat steps above (it may be necessary to repeat this procedure up to four times for severe stains). Neutralize the area by saturating it with a Solution “C” CSS solution (1 part CSS to 3 parts water) to stop any further bleaching action. Extraction-rinse and groom the fibers. Dry area as soon as possible. If a heavy spill, use Pro's Choice Stain Blotter to prevent wicking. IMPORTANT: Red Relief for Wool is not self-neutralizing and MUST be rinsed from carpet after treatment. VIDEO: Presentation by Bane-Clene’s chemist, Don Terry, at a rug cleaning, spot and stain removal class for professional carpet cleaning companies at the Bane-Clene training center in Indianapolis.